The Door is written for a younger audience, much like The Hobbit in the Lord of the Rings Series. The other books in the series, The King, The Castle, and The City, are written for young adults and older adults. The final book The City should be available by December 2015. The Door is also a complete story in itself. The King, The Castle and The City build one on the other. 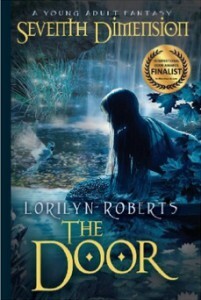 Seventh Dimension – The Door, A Young Adult Christian Fantasy, is the first book in the Seventh Dimension Series that combines contemporary, historical, and fantasy elements into a Christian “coming-of-age” story. A curse put on Shale Snyder, because of a secret, shrouds her with insecurity and fear. Following suspension from school, Shale’s best friend isn’t allowed to see her anymore and she feels abandoned by her family. When a stray dog befriends her, she follows it into the woods. There she discovers a door that leads to another world–a garden with talking animals, demonic underlings, and a king unlike any other. Can Shale overcome her past, defeat the underlings, and embrace her eternal destiny?